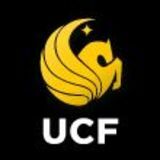 University of Central Florida UCF is a thriving pre-eminent research university located in metropolitan Orlando, one of the most popular regions in the world. Our university benefits from a diverse faculty and staff who create a welcoming environment, a high quality of life, and opportunities to grow, learn and succeed. The UCF campus is 13 miles east of downtown Orlando and adjacent to one of the top research parks in the nation. The university also has 10 regional campus locations throughout Central Florida and recently graduated the charter class from its fully accredited College of Medicine in the Medical City at Lake Nona. With 60,810 students, UCF is the largest university by enrollment in Florida and the second-largest in the nation. It has more than 11,000 employees and an operating budget of $1.5 billion. UCF researchers set a record in fiscal year 2014 for funded research, receiving $145.6 million. In Fall 2014, the freshman class had an average SAT two-score of 1256, The Burnett Honors College enrolled nearly 1,700 students, and the number of incoming National Merit Scholars ranked UCF among the top 40 colleges and universities. The university offers 92 bachelor’s, 83 master’s, and 31 doctoral degree programs, and it leads all universities in Florida in conferring more than 15,000 degrees a year. UCF is committed to innovative community partnerships, world-class research with local impact, and the integration of technology and learning. EDWARD M. ELMENDORF SENIOR VICE PRESIDENT, GOVERNMENT RELATIONS AND POLICY ANALYSIS, AMERICAN ASSOCIATION OF STATE COLLEGES AND UNIVERSITIES, WASHINGTON, D.C.
environment for artistic expression of every kind. producing leaders in health and public service. Burnham and the V.A. Medical Center. provide high-quality patient care to serve the needs of a changing population. students for their future roles. Optics and Lasers, the Florida Photonics Center of Excellence and the Townes Laser Institute. administer major events and promote national and international tourism. The largest college at UCF offers undergraduate and graduate degree programs that range from anthropology to chemistry to political science. vision lead to successful partnerships. mutual respect and shared goals. $1 billion in downstream impact. new technologies with mutual objectives. diversify the local and state economy. Last year, a record $145.6 million came from federal, state and industry partners. Mending a Broken Heart Heart attacks occur when blood vessels in the heart become blocked, leading to the death of heart cells and a hardening of the heart muscle. Professor DINENDER SINGLA is researching ways to replace dead heart cells with stem cells. If successful, he will improve the quality of life for people with heart disease and also save lives. â&#x20AC;&#x153;I was triggered to do my research because my mother suffered from diabetes and heart issues. Because of that, I want to work to solve these problems.â&#x20AC;? O P P O R T U N I T Y. GROWTH. SUNSHINE. Our faculty members hold 336 international degrees, including 139 doctoral degrees from 49 countries. Silver Lining Associate Professor of Biomedical Sciences WILLIAM SELF and MOSES MURDOCK, ’13, share a common interest — silver. Their work at the Burnett School of Biomedical Sciences on the therapeutic uses of silver ion is garnering attention. Merging Art Forms As a professor of music in the School of Visual Arts and Design, STELLA SUNG helps students bridge the gap between traditional art forms and cutting-edge technology. Sung is also an internationally renowned composer, creating new works for opera, orchestra and ballet, and leads UCF’s Center for Research in Education in Arts, Technology and Entertainment. Better Together When Associate Professor of Physics COSTAS EFTHIMIOU proposed a research project involving string theory to student CHRISTOPHER FRYE, ’13, an ideal collaboration was conceived. Under Efthimiou’s mentorship, Frye became a Barry M. Goldwater Scholar, a highly competitive award for scientists, engineers and mathematicians. In 2013-14, the UCF Knights won titles in women’s soccer, softball and football — all during the inaugural year of the American Athletic Conference. The Knights’ landmark victory in the Jan. 1 Fiesta Bowl earned acclaim on the national football stage. There’s even bigger news off the gridiron. UCF student-athletes have a graduation success rate of 95 percent, the highest rate of any NCAA Division I public institution in the nation. With new facilities, great action and plenty of sports to choose from, UCF makes it fun to root for the black and gold. Orlando A Great Place to Work and Live Orlando has seen rapid growth and economic expansion in recent years and is a center for the life sciences, medical innovation and technological developments. That’s why Orlando ranked No. 9 on Forbes’ 2014 list of the fastest-growing cities in the U.S., and Fast Company magazine has included Orlando in its list of “Best Cities for Innovation.” Plus the sunshine and warm climate create a perfect environment to live, work and explore. Educated Workforce Each year UCF graduates 15,000 students. Many stay and enter the workforce armed with an education that translates into greater earning power. Some go out of state, adding to the growing national reputation of UCF and Orlando. UCF professors also help and work side-by-side with the community on joint projects — from teaching underprivileged children to read to protecting the environment, and from developing health care solutions to finding alternative energy solutions. 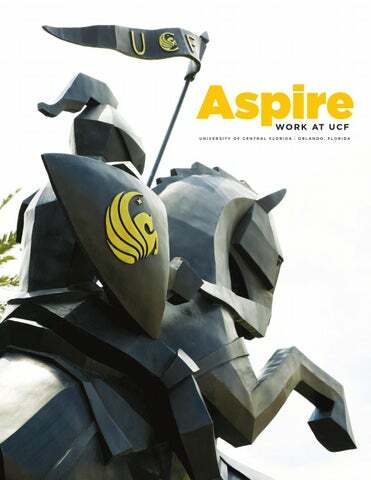 Major Employer UCF is one of Central Florida’s largest employers, with 1,961 faculty members and more than 9,000 staff members. The university impacts more than 112,000 additional jobs and adds $7.73 billion of value to the economy, according to a 2009-10 study by the Florida Board of Governors. adjacent Central Florida Research Park work with UCF researchers and students on projects in the sciences, engineering, photonics and optics, modeling and simulation, and healthrelated fields. recognize faculty excellence and productivity. The center provides faculty members with information and support for teaching online. We offer best practices, assistance from instructional designers, and tools for interaction and assessment. For more information, visit cdl.ucf.edu. The center promotes research and offers resources for careerfamily balance, a successful women seminar series, one-onone mentoring and more. Visit womenfaculty.afia.ucf.edu to learn more. • Development conferences and workshops • Support for educational research • Adjunct and graduate assistant training • Technology support • New faculty orientation • Class observations • Course innovation projects Learn more at fctl.ucf.edu. Virtual Sights, Sounds … and Smells of War Olfaction distinguishes UCF’s post-traumatic stress disorder (PTSD) treatment program. DEBORAH BEIDEL, director of the Anxiety Disorders Clinic, uses olfactory stimulants such as “Moroccan marketplace,” “body odor” and “weapon fire” to stimulate the part of the brain that handles memory and emotions. We're Hiring 200 new faculty. Will you join us?